Another second-generation racer, Conor Daly is rapidly working his way up the auto racing ladder. Daly, 22, from Noblesville, Ind., is now accepting questions as the latest Online Driving Instructor. His answers will be posted beginning Monday, December 23. Like so many of his peers, Daly began his career in karting and has carved quite a reputation for himself since making the step into cars with the Skip Barber Racing Series in 2007. He won the championship convincingly in 2008, earning himself a MAZDASPEED Driver Development scholarship to progress into Star Mazda (now Pro Mazda) for the following season. Daly also was awarded a prestigious Team USA Scholarship, which he used to excellent effect by becoming the youngest ever winner of the Walter Hayes Trophy Formula Ford event at Silverstone in England. After a solid learning year, Daly romped to the championship during a record-breaking 2010 campaign with Juncos Racing, claiming a second MAZDASPEED Scholarship. He then set his sights on returning to Europe. Daly split his time between Indy Lights and the GP3 Series in 2011, finishing third on his Indy Lights debut at St. Petersburg and then winning at Long Beach before concentrating his efforts on GP3. He has become known as one of the finest overtakers in the business and finished a career-best third in this year’s championship standings. 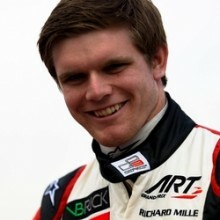 Daly also has broadened his horizons by winning the inaugural MRF Challenge series in India in 2012/2013; making an impressive GP2 Series debut in Malaysia; and driving for IndyCar legend A.J. Foyt in the Indianapolis 500. 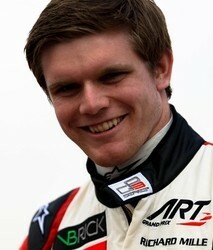 Conor Daly answers your questions! What do you eat over a race weekend to help with your energy levels? Are there any foods you avoid? As drivers I think we all have to be conscious of what we eat and make sure to eat healthy. I always try and avoid junk foods. Usually the night before a race drivers load up on carbs to prepare for the race the next day. Which F1 driver (of all-time) do you most admire, and why? I admire Michael Schumacher because I think he just did the job better than everyone else in his era. I think now it’s hard to beat Sebastian Vettel but I also would like to see how he did if he swapped places with Fernando Alonso at Ferrari…. There seem to be a lot of differences between racing in Europe and in North America. What is your perspective on “blocking” versus “driving defensively” – and how the rules are operated on either side of the Pond? I think in Europe it’s basically anything goes. I have been blocked many times over there and it has totally been against the rules but in the end unless you get wrecked, the officials don’t seem to care. INDYCAR has done a good job in enforcing the rule most of the time and in reality I do think you need a rule against blocking. I think driving defensively is acceptable and creates the best racing, but all-out blocking is dangerous. You don’t have a lot of experience yet on the ovals, but you obviously learned a lot last year working with A.J. Foyt’s team at Indianapolis. What was your first impression of the ovals and what do you think are the keys to success on them? I really like ovals. I had a great time on ovals in Star (Pro) Mazda and learned a lot in those days. It is a really cool experience at such a high speed trying to feel the most minute balance issues with the car to make it just a hundredth — even a thousandth — of a second quicker on a high-speed oval like the Indianapolis Motor Speedway. The key to success on ovals though is all about the car. If you’ve got a solid well-balanced car that gives you confidence you’ll be one of the quickest out there. The most important thing I think though is experience. I think the guys who are the best at IMS right now are the guys with experience like Tony Kanaan last year. Arguably perhaps, there seem to be more opportunities for drivers these days in sports car racing as opposed to open-wheel. Do you agree and, in any case, how important do you think it is for drivers to gain a background in open-wheel racing? There are indeed lots of opportunities in sports car racing which I think is great. I think it is very important to get a good base of experience in open-wheel racing if you can because it will help you no matter what career path you choose. I think sports car racing is still heavily dominated by more experienced guys who have been in racing for many year which unfortunately doesn’t leave much space for young drivers quite yet. It is certainly looking up though now that the two series in North America have merged (to form the Tudor United Sports Car Championship)! I’m sure almost every race car you have driven so far has a different layout in the cockpit and a variety of controls, especially the F1 car when you did some development work for Sahara Force India. How did you manage to get your head around how all the different systems work? As my Dad says, race cars all do the same thing. They go, stop, turn left and right! Of course, some cars do these things at quite a high level of speed. The F1 car was obviously very cool because I had to read a manual before getting into the car about the steering wheel. A lot of incredible controls and different settings for almost everything. Part of me feels like it’s a bit over the top but hey, if that’s the way they like to do it, they can do whatever they want! Understanding it all, though, is part of the job; being a racing driver is a lot more actual work than just driving. We have to live and breathe the sport, study every aspect of our car and learn everything the team wants us to know and then some. Having won the Walter Hayes Trophy race, it must have been pretty obvious that you were more than just a bit talented. Why did you not go to Europe then and race in Formula Renault rather than waiting and then jumping in at the deep end in GP3? What advice would you now give to talented youngsters who do really well in the Skip Barber Series (an obvious first step)? Should they continue up the U.S. ladder or try to make it in Europe? And why? Good luck to you! When I won the WHT race I already had won the 2008 Skip Barber National Championship which gave me a fully funded ride in Star Mazda for 2009 so I couldn’t turn that down. I didn’t have the funding to do anything like Formula Renault so I had to take the scholarship of course. The only way you can take on the European ladder right now is if you have a lot of funding behind you. Unfortunately, that is all that matters. Formula 1 teams seem to only be taking drivers bringing 15 million euros or more and that is unfortunate for young guys coming up without a huge group of funders behind them. However, if you do choose to go to Europe and race in the support series for a few years like I did, you will without a doubt be a better driver for the future whereever you end up choosing to go in racing. I have more experience now than I would have ever got by staying in America. What was your immediate reaction when you had that freak crash at Monaco? I wanted to get to the next race and start fresh! Hello Conor. Thanks for taking the time to answer questions. How exactly do you work on sponsorship deals? Do you work through connections or cold calls? If both, which seems to work the best and do you have to take different approaches to each? Thanks again and best of luck finding a ride for next season! Thank you! It is harder than ever to get support for anything, but at the moment I’m just trying to get introductions to people through people I already know. If you can get in touch with people who might be interested through a person who you are already friends with, that might open a door more easily for you. I’m hoping it does in my situation at least! Always be looking for business-to-business deals as well. Those are happening more often than regular corporate sponsorship these days. SAFEisFAST.com Video: Sponsorship: Where to Begin? You had a very strong 2009 in Star Mazda. You came back in 2010 and had a record year. How did you approach your second year in the series? Thank you! I just had to capitalize on all I learned in 2009. I made some mistakes in 2009 and my Dad made sure to make me aware of them, and we prepared to correct them for 2010. I just felt much more comfortable after a year in the series and everything went smoother. I knew what I needed out of the car and the team gave it to me. It was a fun year! To you as a driver, when you are signing a contract, is the team’s package or car more important or the money? The team package is obviously important because if you sign a contract with a team for a lot of money and they perform at a low level, it’s not good for your future. I have never been in a position where a team offers to pay me for a season though so I wouldn’t really know what that is like, hah! I’ll give you an example for a young driver coming up though. When you find the budget to go racing, you want to take it to the team that will give you the best opportunity to win. However, it shouldn’t always be based on the team’s prior results because sometimes you can get with a team maybe not quite at the top level but they have great people and you work with those people really well. Then you can develop the car to a higher level and turn that team into a winning team. If you were to pick any F1 team (excluding Red Bull), which one would you pick? I would choose Ferrari because of their history in the sport; and driving for Ferrari is such a prestigious honor. Hi Conor, what do you find works best for you for pinpointing your braking and turning references? Thanks. If you do enough research before you get on track you should already have an idea of where you are going to brake. Once you get on track you go to that point and if its too early you adjust for that and if it’s too late just bring it back slightly. Turn in points will depend on how you are driving the car and what kind of balance the car has. Sometimes your turn in point will change depending on the balance of the car so you have to be prepared to adjust your driving on the fly. Hello Conor. We met at the PRI convention but I had a few more questions for you. Do you see it as an advantage to have a father as a racer? Also, do you suggest front brake bias, center brake bias or rear (Newgarden called it “go-karting it through the corners” with rear bias)? Thank you. Good luck next year! I think it is definitely an advantage. My Dad has been all the way to the top level of the sport so most importantly he knows what it takes to get there. His guidance has been huge. After driving on Pirellis which lock and flat-spot extremely easily, I tend to use more rear bias than normal. What major part of the track (the weather, surface, or corners) is the biggest challenge for you as a driver? It all depends on the track really. Some tracks are a lot more difficult than others with blind corners or elevation changes. The rain will also change things massively! As a driver you have to be prepared for anything. Hi Conor! I’m currently 20 years old and really want to apply for the Skip Barber IndyCar Academy Scholarship, as I have absolutely no experience racing and not much money. Is this a good way to get started? I really feel like there’s not many other ways to get into open wheel racing at my age. Thanks! The Skip Barber INDYCAR Academy — or the Skip Barber school in general — is absolutely the best way to do it. It is so hard these days to get into racing without any kind of financial backing so that is your first and really main hurdle. I wish I had the correct answer for that question but it’s a never ending struggle for any driver. If I am looking to get fit for a professional driving career, where would you recommend that I go for such services? I would recommend a place where I train in Indianapolis called St. Vincent Sports Performance. They are an incredible group of people who work with all kinds of athletes from Olympians to NFL, NBA, NHL and racing drivers, of course! Hi Conor, what do you think is the best way to keep in mind all the things you’ve learned? You have to know and remember many things on a race weekend to be successful but it’s really tough to handle with the new stuff especially when you are a rookie. So what is the most effective way to use your theoretical knowledge hands-on on a race weekend? A lot of people like to take notes. My Dad is a big note taker but I am not. He has always tried to get me to take more notes but that’s just not the type of person I am. I have definitely learned to take more notes over the years but I prefer technology so I will always take the notes on my phone or keep things on my laptop and have the data at hand whenever I need it. Most of the things you learn as a driver start to become things embedded in your brain which is helpful! What was your biggest impediment to driving a car at the limit and what did you do to overcome it? I used to overdrive in qualifying, a lot. I would push the car so hard that it was beyond the limit and it would slow me down. I would have the rear of the car so sideways while keeping the throttle down it would look very nice but not fast! To fix this, I had to do some mental training. It was more of a mental problem than a physical one. I worked with a mental coach for a year and a half and was able to give my best qualifying performances this year after the work with the coach. I still have the tendency to overdrive in qualifying but I’ve toned it down and almost fixed it on more occasions. It’s a never ending effort to improve your driving! I think the most difficult thing to deal with is the stress of the off season every year. I have never had security in multiple year deals or anything like that. After every season of racing there is a time where you don’t know if it will continue or not. I have never had the funding from my family so it’s not a question of “what should I race next?” It’s been more like “how are we going to find this money to go racing next year, and what if we don’t?” This question is more prevalent than ever right now. I hate every bit of it because all I want to do is go racing. I want to get to work with a team I’m driving for and focus on the job, racing and winning. Unfortunately, it’s just not that easy. Do you believe that a disabled driver (such as myself) would have a chance to be seen as more than a gimmick? If so where should I start without having funding? I believe anyone has a chance. I don’t necessarily have an answer exactly to how you would do it since I’m not familiar with your disability but if you’ve got the pure driving talent, someone will notice. Again the funding question is hard to answer. Go to anyone you know and anyone those people might know and ask them for help. See if you can find someone (who has money) who really believes in you and your program and will help you get off the ground. You obviously have good (racing) genes but was there a particular moment in time when you first realized you might have a real chance of making a career in racing? The moment I really thought I could do it was when I started moving from karts to cars. 2008 was my first full year in cars and I was able to win the Skip Barber championship, so after that it seemed pretty real. Raining in the rain seems to be an art form. Do you like racing in the rain – have you done much of it and have you had much success? – and how do you adapt to the different conditions? Racing in the rain is one of my favorite things to do. I always seem to go well in the rain – winning the Walter Hayes Trophy Formula Ford race in England in ‘08 was a great learning experience in rain/sleet! I feel like I’ve got a very high level of car control and confidence when the “danger” level is higher in the rain. You have to do recon at a very quick rate to find where the grip is on track before everyone else. A lot of people try this but also find themselves flying off the track. That is another element to racing in the rain! It’s all about keeping yourself on track. Hey Conor, I’m currently racing karts and I am trying to find sponsors to make it to the next step. I’ve tried to contact companies attempting to gain sponsorship but I can’t seem to get in touch with the right people. So, how could I get a hold of companies that are interested in motorsport partnerships? Honestly man thats exactly what I’m trying to do right now as well hah! THAT is the biggest question in racing. Most of my racing has been funded by scholarships I’ve won from the Mazda Road to Indy and the Sahara Force India F1 team. Now that all of that is gone I’m pretty much starting at zero for next year! All I can tell you is keep calling people. Make it personal and get close to as many people as possible. Ask everyone you possibly know what business they are involved in and see if you know other people you can connect them with. That is how a lot of deals are getting done these days, business to business. I wish I had a better answer! How difficult was it for you to make the transition from karting to cars? What were the biggest differences in terms of driving style? It was actually easier than I thought it would be. I think what helped that though was the skip barber racing school. They have such good instructors and the regional races you could do before stepping up to the national level was great preparation. The cars were also not at a super high level so it was a good step to go to from karting. Biggest difference overall though is everything happens slower because the car is so much heavier than the kart! I recently began Spec Miata racing. I am looking to develop as a driver. I’ve started to do track/practice days to achieve this goal. What are your thoughts on how to approach each session in the car. The day usually consist of four half-hour sessions. In other words, what should I be focusing on as the sessions progress through the day to maximize my development? Thank you. I think the key is to do as many laps as possible. Every lap you do on track you learn more! Focus on your reference points – brake points, turn in points, apexes are all things to focus on. If you feel like you can brake later, gradually move your braking reference forward. Also try and think about what the car is doing, how can you improve it. Try not to get ahead of yourself and focus on consistent improvement. I think your first step would just be getting to local race tracks and talking to as many people as you can. Get a feel for what’s around and what you can get into. I started in karts when I was 10 which is a bit different to your situation but there is no age limit to karting! Get into a kart if you can because you’ll learn a lot and it’s a lot of fun. I have two sons in karting. Is a driving coach worth the money and if so at what age would you recommend getting a coach? Thank you for your time. And best of luck to you this year. You deserve a quality seat, and I hope you get one. I think it definitely is worth the money. I’ve worked with driver coaches myself even in GP3 and it is a big help sometimes. A driver coach can get a lot out of the driver by asking the right questions and getting a young driver to think on a deeper level about whatever they are driving. What do feel has been your biggest asset climbing the racing ladder? Mazda Road to Indy Scholarship, to be honest. I wouldn’t be where I am today without that! How do you get yourself psyched up for qualifying, when you know you have to lay down a perfect lap? Is your mind-set different before you get ready to start a race? I have actually done a lot of mental training over the last few years in regards to qualifying. I have always been a better racer than a qualifier. I have slowly improved my qualifying performance and this year it really showed. I was able to get my first pole and out-qualify one or both of my teammates six of eight weekends. It was always different in GP3 though because of the Pirelli tires. They would only last one lap so it was all about being absolutely perfect on your one ultimate lap which is a very difficult thing to do. Indy Lights was different because you could keep pushing for almost eight laps in a row and constantly improve. I always try to listen to music before qualifying but really just focus on my reference points and doing what I know how to do. Don’t try and make any magic happen; there is no magic in racing! Hey Conor, I’m a big fan of yours and I heard you have dreams of going to F1. I know you can represent the U.S. very well and I wish you luck. My question for you is what is the best way to get started into any type of racing at what these days is considered such a late age (18)? And what is the best way to get noticed to hopefully move up the ranks while gaining driving experience? Good luck in your future racing career! Thank you! That’s a tough question to be honest. The racing world has always been money driven but it’s even more so these days. The only reason I’ve been able to move through my career without a lot of big sponsorship has been through the Mazda Road to Indy. I’d say the best way to get into it is the Skip Barber Racing School series and then get yourself into the Mazda Road to Indy. I wish I had some secret formula to give you but unfortunately there isn’t one! You’re still relatively new to the sport but you’ve already had a couple of big wrecks (sorry for reminding you!). I’m thinking of Monaco in the GP3 car and Indy in practice this year. What goes through your mind when you realize you’re about to crash? What do you do to try to minimize the damage…both to yourself and the car? I’d say I’ve actually done a decent job getting through 12 years of racing with only two big crashes! Racing is always going to be dangerous; it’s just part of the sport. There is no mental preparation for crashing because if you think about crashing, you’re going to crash. If you are out of control, do everything in your ability to reduce the damage to the car but if you’re going to hit, take your hands off the wheel. How do you rate your technical knowledge about the cars you race, or do you think it’s important to have a technical understanding of how the cars work? If so, how do you go about improving your knowledge? Technical knowledge is probably the most important thing you can bring to a race team. Technical knowledge is important but it’s mainly technical feedback that you need to be able to relate to a team. This is one thing my Dad has had me work on ever since I was in karting, and now I’m really confident in my feedback to the team. Ask whatever team you’re with a lot of questions; do everything you can to immerse yourself in the setup of the car and learn what every change might do. Conor, you’ve driven of different formula cars (Skip Barber, Star Mazda, GP3, GP2, Indy, etc.). How long does it take to get used to the different dynamics of a new class of vehicle? At first it took me several test days to get really comfortable in a new race car. It took me seven days of preseason testing in the Indy Lights car in 2011 to fully get to grips with it and when I showed up at the first race in St. Pete it all “clicked.” Since then though I haven’t had the luxury of that much preseason testing so it’s been a major learning curve jumping straight into something like a GP2 car and performing right away. As my Dad says, “race cars all do the same thing.” It sounds silly but they really do. Whenever you jump into something bigger and faster, you still have to work on the same things to get to the limit of the race car that you did in the previous class below. How has your relationship with your father, who was a successful pro racer before becoming a broadcaster, been of value in your development as a racer, and are there any ways it’s created pressure for you as a racer? It’s been great because he knows the racing world so well. He also knows what it takes to be a professional racing driver and what kind of sacrifice and commitment it takes. It’s been a tough relationship because he is always trying to get the best out of me which is not always fun from my perspective growing up but in the end I’m glad he did because I’m a better driver because of it. The biggest thing we focus on is how I can turn my weaknesses into strengths. As a young man who clearly has a need for speed, how tempting is it to drive “too fast” on the street? How important is it for you, as an upcoming racer, to set a good example to others and what can you do to help promote safety on the roads? It might be surprising but I was never really the kid growing up to try and test the limits on the road. I care too much about my racing career to make stupid decisions off the track. I think I’ve had two speeding tickets total since I got my license when I was 16. The risk just isn’t worth it!